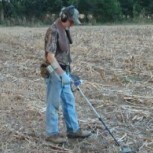 Interests: Metal detecting, fishing, hunting, outdoors! I have seen a few posts where the 1943 S war nickels especially, read high. I finally got one at an old fairground in Kansas. Kansas is next to Oklahoma. Are we really seeing a pattern here? Nice find! I have had war nickels read higher than 13 or 14 but never a 21 that I can recall. This thread is called high number war nickle, I just figured its a spin off of another thread with you guys debating why a coin has a slightly higher TID then the rest. Ok, I guess I misunderstood what you thought was confusing, but I was also familiar with the two other long-time threads that had been contnuously discussing this issue so there was no doubt in my mind about what Tom was saying. Funny, I can now see that depending on your frame of refrence you could find the original post perfectly clear or totally confusing, especially when it comes to the nuances of foriegn or US coinage. Nevertheless, war nickel or not it was a high VDI for a nickel (denomination) coin. 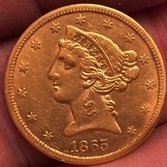 The use of the term "nickel" is a misnomer in this case because it is related more to the denomination of the coin than it's metallic makeup. Here are a couple that will confuse you. My first ever war nik was high reading of 23-25. The few after that were solid 13-14. The one on the left is 13-14 and the one on the right is 23-25....both are '43 S.
I read somewhere that it was at the discretion of the mint to ever so slightly bump up the silver content. I believe I read it this way but I could be wrong or forgot the details of what I read. There was a lengthy discussion about war nickles on the dankowski forum and it was concluded that during the war time there were significant variances from the typically noted 35% silver, 9% manganese, and 56% copper composition. San Francisco was a major contributor to WW2 building ships, subs, munitions, etc., so I don't doubt that there were times the mint simply couldn't stick to the formula due to war time needs.